Sharp growth in illegal immigration and increased enforcement of immigration laws have dramatically altered the ethnic composition of offenders sentenced in federal courts. In 2007, Latinos accounted for 40% of all sentenced federal offenders—more than triple their share (13%) of the total U.S. adult population. The share of all sentenced offenders who were Latino in 2007 was up from 24% in 1991, according to an analysis of data from the United States Sentencing Commission (USSC) by the Pew Hispanic Center, a project of the Pew Research Center. Between 1991 and 2007, enforcement of federal immigration laws became a growing priority in response to undocumented immigration.1 By 2007, immigration offenses represented nearly one-quarter (24%) of all federal convictions, up from just 7% in 1991. Among those sentenced for immigration offenses in 2007, 80% were Hispanic. The United States Sentencing Commission (USSC) was established in 1984 to create sentencing guidelines for the federal courts as part of the Sentencing Reform Act. One of its missions is to collect data on all federal criminal cases sentenced under the Federal Sentencing Guidelines (USSC, 2007a). The data files available from the USSC include all cases that resulted in a sentence from fiscal 1991 through fiscal 2007. The total number of offenders sentenced in federal courts more than doubled from 1991 to 2007. During this period, the number of sentenced offenders who were Hispanic nearly quadrupled and accounted for more than half (54%) of the growth in the total number of sentenced offenders. One reason all of these figures have risen so sharply is that immigration offenses, unlike most other criminal offenses, are exclusively under the jurisdiction of federal rather than state or local courts. In 1991, three times as many Hispanics were sentenced in federal courts for drug crimes (60%) as for immigration crimes (20%). By 2007, that pattern had reversed; among Hispanic offenders sentenced in federal courts, 48% were sentenced for an immigration offense and 37% for a drug offense. Among sentenced immigration offenders, most were convicted of unlawfully entering or remaining in the U.S. Fully 75% of Latino offenders sentenced for immigration crimes in 2007 were convicted of entering the U.S. unlawfully or residing in the country without authorization, and 19% were sentenced for smuggling, transporting or harboring an unlawful alien. The convictions broke down largely along citizenship lines. Among sentenced non-citizen Latino immigration offenders, more than eight-in-ten (81%) were convicted of entering unlawfully or residing in the U.S. without authorization. In contrast, more than nine-in-ten (91%) U.S. citizen Latino immigration offenders were convicted of smuggling, transporting or harboring an unlawful alien. Hispanics who were convicted of any federal offense were more likely than non-Hispanics to be sentenced to prison. But among all federal offenders sentenced to prison, Hispanics were also more likely than blacks or whites to receive a shorter prison term. These racial and ethnic disparities in sentencing appear to be linked to USSC guidelines that attach clear boundaries for the types of sentences that can be meted out for different types of crimes. This report examines the ethnic, racial and citizenship status of sentenced offenders in federal courts. It is important to note that the federal courts represent a relatively small share of the overall criminal justice system in the United States. According to the Bureau of Justice Statistics, in 2004 only 6% of all offenders sentenced for a felony were sentenced in a federal court; the remainder were sentenced in a state court (Durose and Langan, 2007). Inmates held in federal prisons represent a small share of all inmates held in correctional facilities in the United States. According to the Bureau of Justice Statistics, in 2007 nearly 2.3 million inmates were held in state prisons, federal prisons or local jails. Only about 200,000, or 8.6%, were held in federal prisons and facilities. Hispanics represented nearly one-in-three (31%) inmates incarcerated in federal prisons in 2007, a greater share than whites (28%) but a smaller share than blacks (37%) (Bureau of Justice Statistics Program). This stands in sharp contrast to the ethnic and racial makeup of state prisons and local jails, where more than nine-in-ten (91%) of the 2.3 million inmates in this country are held. Among inmates held in state prisons, 19% were Hispanic, 36% were white and 39% were black in 2005 (West and Sabol, 2008). Among inmates held in local jails, 16% were Hispanic, 43% were white and 39% were black in 2007 (Pastore and Maguire, 2009). According to the Pew Center on the States (2008), incarceration rates vary greatly across racial and ethnic groups. In 2006, 1.5% of Hispanic adults were incarcerated, while 3.4% of blacks and less than 1% of whites were behind bars. The data for this report are from the United States Sentencing Commission’s Monitoring of Federal Criminal Sentences data files for fiscal years 1991 through 2007. These files contain information on all federal court cases in which an offender was sentenced. Only those cases with documentation compiled by the USSC are included in the data files. Prior to fiscal 1991, the commission utilized an alternative data collection method (Reedt and Widico-Stroop, 2008); data from those years are not included in the analysis presented in this paper. 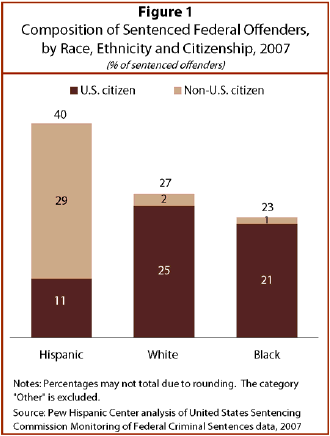 Hispanics represented 40% of all sentenced federal offenders in 2007, the single largest racial and ethnic group among sentenced federal offenders. Whites constituted 27% of federal sentenced offenders and blacks 23%. The remainder (10%) are Asians, Native Americans and those whose race and ethnicity is indeterminate. More than seven-in-ten (72%) of Hispanics sentenced in federal courts in 2007 did not hold U.S. citizenship. They accounted for 29% of all federal offenders in 2007. Latino offenders who did not hold U.S. citizenship represented a greater share of all Latino offenders in 2007 than in 1991—72% versus 61%. Between 1991 and 2007, the number of Hispanics sentenced in federal courts nearly quadrupled (270%), rising faster than the number of offenders sentenced in federal courts over this period and accounting for 54% of the growth in the total number of offenders. In 2007, more than half (56%) of all Latino offenders were sentenced in just five of the nation’s 94 U.S. district courts. All five are located near the U.S.-Mexico border: the Southern (17%) and Western (15%) districts of Texas, the District of Arizona (11%), the Southern District of California (6%), and the District of New Mexico (6%). Among all Hispanics sentenced in federal courts in 2007, 48% were sentenced for immigration offenses, 37% for drug offenses and 15% for other offenses. Of Hispanic offenders with U.S. citizenship, more than half (56%) were sentenced for drug offenses, 14% for immigration offenses and 30% for all other offenses. Of Latino offenders who did not hold U.S. citizenship, more than six-in-ten (61%) were sentenced for immigration offenses, 30% for drug offenses and 9% for all other offenses. Much of the increase in the number of Hispanics sentenced in federal courts has come from a rise in the number of offenders sentenced for immigration offenses between 1991 and 2007. Three-fourths of Hispanic immigration offenders were sentenced for entering the U.S. unlawfully or residing in the country without authorization. Nearly two-in-ten (19%) were sentenced for smuggling, transporting or harboring an unlawful alien. More than eight-in-ten (81%) non-citizen Hispanic immigration offenders in 2007 were sentenced for entering the U.S. unlawfully or residing in the country without authorization. In contrast, fully 91% of Latino immigration offenders who were U.S. citizens were sentenced for smuggling, transporting or harboring an unlawful alien. In 2007, Hispanics sentenced in federal courts were more likely than non-Hispanic offenders to receive a prison sentence—96% versus 82%. Hispanics sentenced in federal courts in 2007 received shorter prison sentences than blacks or whites—46 months versus 91 months for blacks and 62 months for whites. Hispanics who did not hold U.S. citizenship were more likely to receive a prison sentence in 2007 than those who were citizens—98% versus 90%. The average prison sentence for Hispanics fell from 58 months in 1991 to 46 months in 2007. Non-U.S. citizen Latinos received shorter prison sentences (40 months) in 2007 than Hispanics with U.S. citizenship (61 months). This report examines the characteristics of offenders sentenced in federal courts. It does not provide an examination of offenders in state or local courts, where the majority of all offenders are sentenced. The data for this report are from the USSC’s Monitoring of Federal Criminal Sentences data for fiscal years 1991 to 2007. These files are the main source of information about the characteristics of federal offenders and their sentences. The terms “Hispanic” and “Latino” are used interchangeably in this report. The terms “whites” and “blacks” are used to refer to the non-Hispanic components of their population. The terms “undocumented” and “illegal” are used interchangeably in this report. Non-U.S. citizens are individuals who are legal (resident) aliens, illegal aliens or individuals without U.S. citizenship whose alien status is unknown. U.S. citizens are citizens by birth or naturalized citizens.